New Version Fireproof Document Bag: OIOSEN fireproof bag is large in size 15.8"x11.5" and built-in compartment make better classify your items. Non-Itchy Silicone Coated Fiberglass: Featured with super high quality silicone coated fireproof fiberglass, no glass fiber will annoy any more. Stands up against fire and heat up to 1000 ℉. Fire and Water Resistant: Both 2 layers are made of supreme fire retardant fiberglass material make it's not only stand up against fire, but it's also highly water resistant. 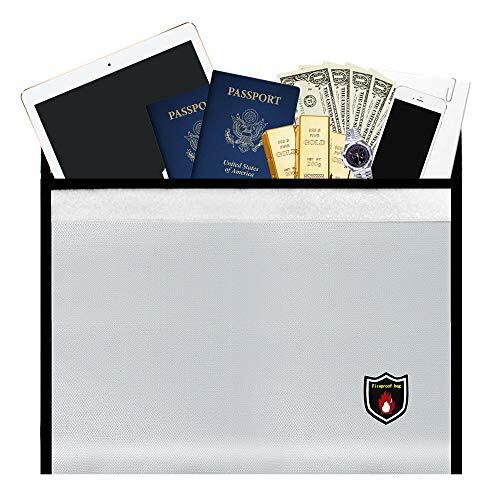 Security Steward: This fireproof bag safe to store your documents & files including legal document files, passport, cash, jewelry, photos, laptop and other valuables. 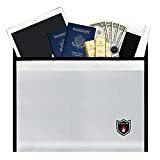 What You Get: OIOSEN Fireproof Safe Document Bag, 100% money back guaranteed, 12-month warranty and friendly customer service.